Hany Maamoon joined Eldib Pandi in 2005. He obtained his L.L.B. from Zakazik University in 1999. Prior to joining our firm, Hany worked as a lawyer for the Legal Department of the Port Said Port Authority which gave him the opportunity to gain an in-depth knowledge on how the Maritime Governmental agency functions. Maamoon handles a vast variety of claims in Port Said and Suez area. He possess a broad experience in dealing with claims involving Ports Authorities, the Suez Canal Authority, and other governmental and non-governmental competent entities in the Suez Canal region. Since the start of his career with Eldib Pandi, Mamoon handled various types of cases relating to maritime transport such as cargo claims, charter parties, and bill of lading disputes to sale, purchase disputes and ship arrests, collisions , grounding and pollution incidents. 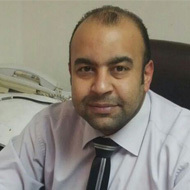 Maamoon managed many high level cases in reference to customs’ accusations brought against carriers where He refuted clients liability in major smuggling cases where the custom’s fines were calculated in tens of millions of Egyptian Pounds. Moreover, Hany has an outstanding record in the Court of Appeals, in particular with force-majeure cases which is very rare in courts’ real practice all over Egypt where he managed to obtain three judgments from Damietta courts of First Instance which were affirmed by the Court of Appeal in which the court allowed our defense and exempted vessel’s owners from liability for the existence of the force majeure . Furthermore, we are proud by Maamoon’s achievements which qualified him to act as a legal consultant for both Port Said and Damietta Chambers of Shipping . The Egyptian Maritime Society (a member of CMI).